WEST BROM BOSS Tony Pulis joked that he was planning on dropping James McClean after the Derry native hit the winner in Ireland’s World Cup qualifier against Wales on Monday. McClean’s goal in the 1-0 win in Cardiff came much to the annoyance of Pulis, who was born in Newport. 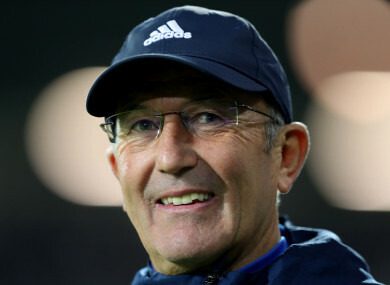 “I just ignored him walking down the corridor,” Pulis told reporters when asked about McClean. “He said ‘morning’ with the biggest grin I’ve ever seen in my life. He won’t be playing for me for what he’s done for Wales! It was a great goal and great technique on his right foot. Obviously it was a goal that killed off our hopes and aspirations. “There’s a bit of banter going around and the manager taking a bit of stick as you can imagine. James has most probably done better for Ireland than he has for us but that sometimes happens. I think we paid £500,000 for him and I don’t think anyone would say James has been anything but brilliant. Hopefully Ireland qualify, fingers crossed, but they have got to get through the qualifying game. “James is a smashing lad, great around the place. Everyone has respect for him. Meanwhile, it’s been confirmed that Wales international Joe Allen will miss Stoke’s match with Man City this weekend. A blow to the head saw Allen taken off in the first half of Monday’s Wales-Ireland game, and concussion protocols mean he will not be available this weekend. We’ve given him a couple of days to stay at home. He came in yesterday, felt a lot better but I think the reality is he’s unlikely to be available for City,” Stoke boss Hughes said in his pre-match press conference. “Concussion’s a thing you can’t take any risk with, we’ve got to follow the protocol. Hopefully, he’ll show some improvement and be ready to come back and train next week. He had a bang to the head. He found it difficult to remember the incident itself, that tells you where he’s at in terms of the severity of it. He doesn’t remember anything. We’ve got to be very careful. Email “"He said 'morning' with the biggest grin I've ever seen in my life"”. Feedback on “"He said 'morning' with the biggest grin I've ever seen in my life"”.